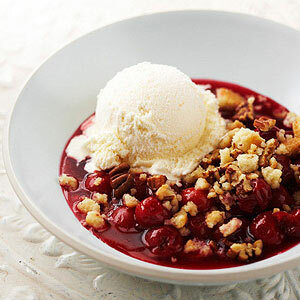 Crumbled shortbread cookies and toasted pecans top succulent red cherries in this easy-to-make dessert. In a small bowl, combine sugar and cornstarch. In a large saucepan, sprinkle cornstarch mixture over cherries; stir to combine. Cook and stir over medium heat about 10 minutes or until thickened and bubbly. Cook and stir for 2 minutes more. Divide cherry mixture among four dessert dishes. Sprinkle cookie mixture over cherry mixture. If desired, serve with ice cream.